Welcome to Vanilla Hill Interiors. Vanilla hill opened in July 2013. 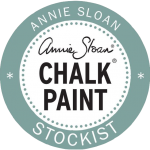 It is a friendly shop with a country/coastal/shabby chic look full of painted and distressed vintage furniture,pretty cushions, lighting and gifts.The accent is on making things unique and sourcing handmade goods from gifted artisans and craft workers.The full colour range of Annie Sloan paint, tester pots and waxes are stocked at the shop. (lots of fun if you want to revamp a piece of furniture!) Chairs are recovered using vintage fabrics, rustic stripes and checks.Lighting is individual and simple ranging from chandeliers to tea light jars with everything in-between.There are gorgeous gifts for birthdays, Christmas, anniversaries or just because!